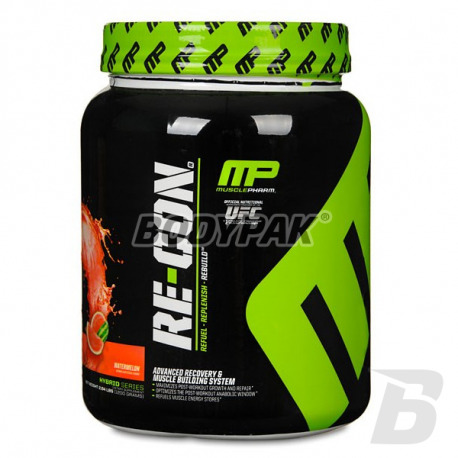 Recon is a unique formula of postprandial highest quality. Recon is designed to maximize the most important phase of training of each athlete. Post-exercise phase. 120 loyalty points Your cart will total 120 points that can be converted into a voucher of 4,80 PLN. 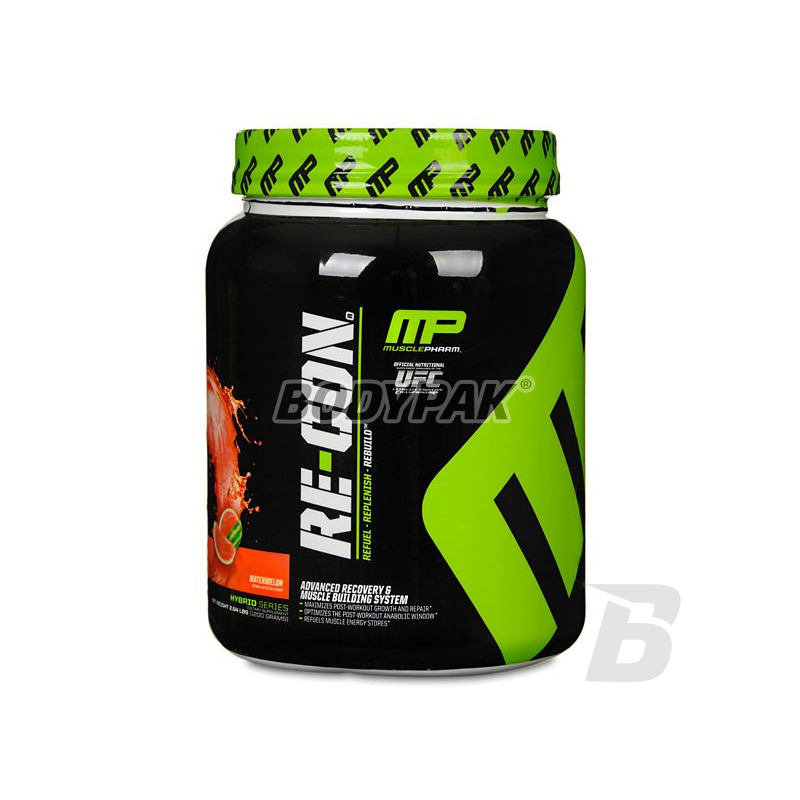 Recon is a unique formula of postprandial highest quality. Recon is designed to maximize the most important phase of training of each athlete. Phase after exercise. Recon is designed to provide hard-training athletes of all that is needed to enhance recovery and growth in every possible way. Every aspect of the reconstruction is properly optimized. One portion for 2 hours before your workout and the second serving - after training. Składniki: Re-Con® Muscle Rebuilding Proprietary Blend: [(Carb Max 3 Stage Delivery System: polimery glukozy, dekstroza, inulina), (Recovery Accelerator: L-Glutamina, L-tauryna, L-Arginina, kwas L-piroglutaminowy), (Anabolic Primer Matrix 3:1:2 BCAA Blend: L-leucyna, L-izoleucyna, L-walina), (EAA Complex: L-glicyna, L-treonina, L-lizyna HCl, L-fenyloalanina, L-metionina, L-tryptofan), (Anti-Stress & Adaptogen Matrix: kwas askorbionowy, dimetyloglicyna HCl (DMG), kompleks lecytyny fosfatydylowej, L-cysteina, Gynostemma Pentaphyllum), (Muscle Extend Matrix: Beta-alanina CarnoSyn®, Jabłczan cytruliny, Ekstrakt z imbiru (Zingiber Officinale) (korzeń)), (Reload Matrix (Insulinogenic): drożdże selenowe, polinikotynian chromu, siarczan wanadylu, ekstrakt z kozieradki (dostarcza 4-hydroksyizoleucynę), gymnema sylvestre), (Muscle Detoxifier: ekstrakt z żurawiny, liść pokrzywy (Urtica Doica), korzeń mniszka lekarskiego (Taraxacum Officinale), jagody mącznicy lekarskiej (Arctostaphylos), Saw palmetto (jagody), bromelina, astaksantyna (kompleks))]; witamina C (kwas askorbinowy), witamina E (octan alfa tokoferylu), witamina B6 (pirydoksyna HCl), wapń (fosforan wapnia i krzemian), fosfor (fosforan wapnia), magnez (tlenek), selen (drożdze), chlorek (chlorek potasu i sodu), sód (chlorek sodu), potas, regulator kwasowości (kwas cytrynowy), aromaty, tlenek magnezu, substancje słodzące (sukraloza, acesulfam K), sól, chlorek potasu, barwnik (E129*). *E129 - może mieć szkodliwy wpływ na aktywność i skupienie uwagi u dzieci. Produkt zawiera soję. Może zawierać mleko, jaja, ryby, skorupiaki, orzechy, orzeszki ziemne, pszenicę.